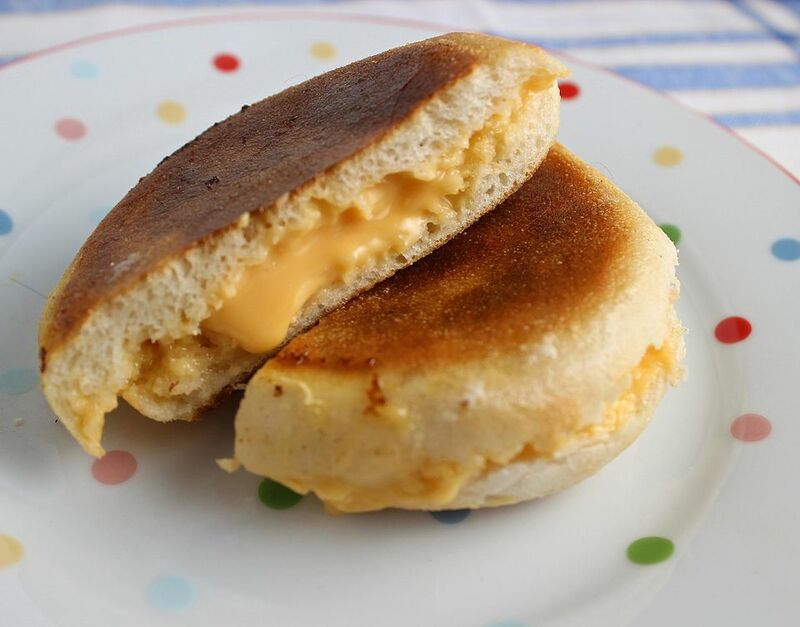 English Muffin Grilled Cheese Sandwiches takes advantage of one the best features of the English muffin - all those crevices fill with melted cheese, while the outside gets crisp and toasty. It's easy to make grilled cheese sandwiches with whatever cheese you have on hand. After much experimentation, I really prefer processed American cheese for this type of recipe, no matter how purists may shudder. That product is made from real cheese, with emulsifiers added so it melts so smoothly and evenly. If you want to use real cheese, I would recommend shredded it so it melts more evenly and smoothly. You can blend the shredded cheese with a bit of milk or some white wine for more flavor and so it melts very smoothly. You can use regular English muffins or whole wheat muffins for this wonderful treat. Just make sure that the heat is moderate, that you cover the pan as the sandwich cooks so the cheese melts evenly, and that you check it often so it doesn't burn. Split the English muffins and place them, split side up, on the work surface. Cover half of the muffins with the cheese, using 2-1/2 slices per muffin and tearing and fitting the cheese to fit. Make sandwiches by covering the cheese with the other half of the muffins, split side down. Butter the outsides of the English muffins. Grill the muffins on a nonstick skillet or griddle over medium heat, covering the sandwiches with pan lids, pressing down lightly with a spatula, and turning once, until the cheese is melted and the muffins are toasted, about 4 to 5 minutes total. You can also cook these on a panini grill. In that case, press down gently on the grill as the sandwiches cook, and cook for 2 to 3 minutes or until the bread is toasted and the cheese is melted and gooey.